In most organisations using Active Directory and Exchange, Exchange servers have such high privileges that being an Administrator on an Exchange server is enough to escalate to Domain Admin. 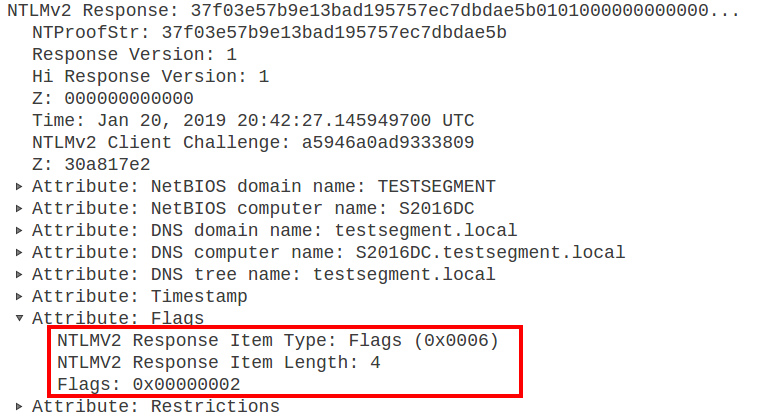 Recently I came across a blog from the ZDI, in which they detail a way to let Exchange authenticate to attackers using NTLM over HTTP. This can be combined with an NTLM relay attack to escalate from any user with a mailbox to Domain Admin in probably 90% of the organisations I’ve seen that use Exchange. This attack is possible by default and while no patches are available at the point of writing, there are mitigations that can be applied to prevent this privilege escalation. 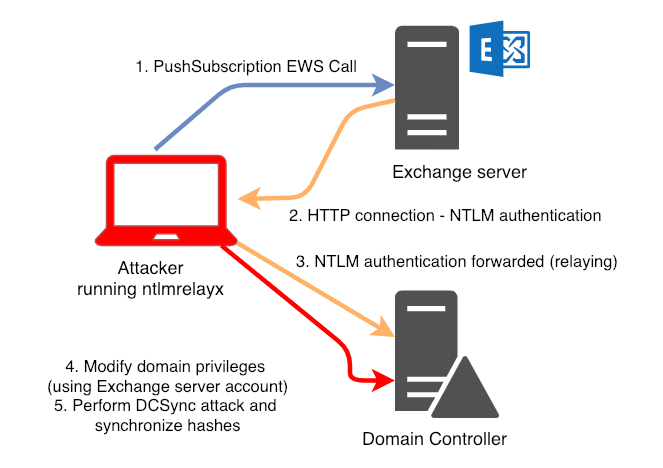 This blog details the attack, some of the more technical details and mitigations, as well as releasing a proof-of-concept tool for this attack which I’ve dubbed “PrivExchange”. The main vulnerability here is that Exchange has high privileges in the Active Directory domain. The Exchange Windows Permissions group has WriteDacl access on the Domain object in Active Directory, which enables any member of this group to modify the domain privileges, among which is the privilege to perform DCSync operations. Users or computers with this privilege can perform synchronization operations that are normally used by Domain Controllers to replicate, which allows attackers to synchronize all the hashed passwords of users in the Active Directory. This has been covered by several researchers (see the references section at the end of this post), and I’ve written about it with my Fox-IT colleague Rindert last year. With that post I also released an update to ntlmrelayx that adds the possibility to perform these Access Control List (ACL) based attack while NTLM relaying. When authentication is relayed to LDAP, objects in the directory can be modified to grant an attacker privileges, including the privileges required for DCSync operations. Thus, if we can get an Exchange server to authenticate to us with NTLM authentication, we can perform the ACL attack. It should be noted that relaying to LDAP only works if the victim is authenticating to us over HTTP, not over SMB (see the section “The technical bits” for an explanation). The only component that was missing until now was an easy way to get Exchange to authenticate to us. A ZDI researcher (who remains unnamed in their article) discovered that it is possible to get Exchange to authenticate to an arbitrary URL over HTTP via the Exchange PushSubscriptionfeature. In their blog post they used this vulnerability to relay the NTLM authentication back to Exchange (this is called a reflection attack) and impersonate other users. If we instead combine this with the high privileges Exchange has by default and perform a relay attack instead of a reflection attack, we can use these privileges to grant ourselves DCSync rights. The push notification service has an option to send a message every X minutes (where X can be specified by the attacker), even if no event happened. This is something that ensures Exchange will connect to us even if there is no activity in an inbox. With all the hashed password of all Active Directory users, the attacker can create golden tickets to impersonate any user, or use any users password hash to authenticate to any service accepting NTLM or Kerberos authentication in the domain. I mentioned previously that relaying from SMB to LDAP does not work, which is also why this attack can’t be performed by using for example the SpoolService RPC abuse that was recently released (since this authenticates over SMB). Since questions about this keep coming up and there is a lot of confusion about this, let’s look at why this is. If you aren’t looking for a deep dive into NTLM authentication, feel free to skip this section :). When we relay this to LDAP the authentication will succeed, but LDAP will expect all the messages to be signed with a session key derived from the password (which we don’t have in a relay attack). It will thus ignore any messages without signature, causing our attack to fail. One may wonder if it is possible to modify these flags in transit, such that signing is not negotiated. This won’t work on modern versions of Windows since they will include a MIC (Message Integrity Code) by default, which is a signature based on all 3 NTLM messages, so any modification in any of the messages will make it invalid. Can we remove the MIC? Well yes, we can, since it is not in a protected part of the NTLM message. 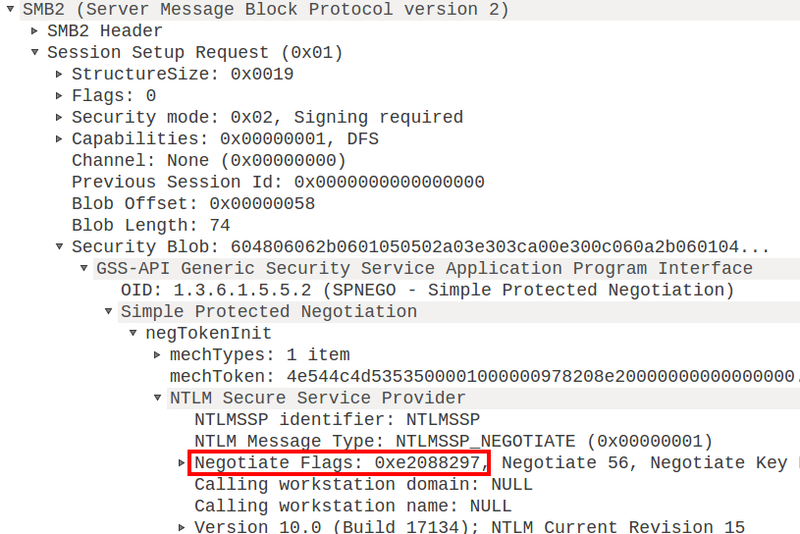 There is however one last protection in NTLM authentication (NTLMv2 only) that prevents this: Deep within the NTLMv2 response, which is in itself signed with the victim’s password, there is an AV_PAIR structure which is called MsvAvFlags. When this field has the value 0x0002, it indicates that the client sent a MIC along with the type 3 message. Modifying the NTLMv2 response will invalidate the authentication, so we can’t remove this flags field. The flag field indicates a MIC was calculated and included, which will make the target server validate the MIC, which in turn validates that all 3 messages were not modified in transit, and thus we can’t remove the signing flag. This holds true for (I think) only the Microsoft implementation of NTLM. Custom appliances implementing NTLM most likely don’t go down till the level of adding the MIC and AV_PAIR flags, making them vulnerable to flag modification and thus making SMB->LDAP relaying possible. An example of this is the Java implementation of NTLM, which can be modified in transit to bypass security measures. This attack depends on various components to work. In previous blogs I’ve already highlighted several defenses against NTLM relaying and against relaying to LDAP specifically. Remove the unnecessary high privileges that Exchange has on the Domain object (see below for some links on this). Block Exchange servers from making connections to workstations on arbitrary ports. Enable Extended Protection for Authentication on the Exchange endpoints in IIS (but not the Exchange Back End ones, this will break Exchange). This will verify the channel binding parameters in the NTLM authentication, which ties NTLM authentication to a TLS connection and prevent relaying to Exchange web services. Remove the registry key which makes relaying back to the Exchange server possible, as discussed in Microsofts mitigation for CVE-2018-8518. Enforce SMB signing on Exchange servers (and preferable all other servers and workstations in the domain) to prevent cross-protocol relay attacks to SMB. Both the above Exchange servers were installed using Shared permission mode (which is the default), but according to this writeup RBAC split permissions deployment is also vulnerable (I haven’t personally tested this). Remote NTLM Relaying through meterpreter which discusses how to relay through a pivot host remotely. Hacker, red teamer, researcher. Likes to write infosec-focussed Python tools. This is my personal blog mostly containing research on topics I find interesting, such as Windows, Active Directory and cloud stuff.